EVSE LLC is an established innovator in the electric vehicle battery charging industry with installations including Southern California Edison’s workplace charging locations, the largest smart grid/automated demand response deployment in the world. For this application, SCE chose the 3703 ChargeWorks, EVSE’s competitively priced Level 2 and Level 1, 7.2 KW, single or dual wall- or pole-mounted electric car charger. Like all EVSE LLC chargers, the 3703 can operate standalone or on a network, including Greenlots Open Charge Points Protocol (OCPP) to ensure universal access for all EV drivers – no member cards needed. The model 3703 is capable of being controlled remotely to apply, reduce or disconnect power to the electric vehicle, and measures both voltage and current being supplied to the EV. Turn the charger on using simple On Activation, a mobile phone app or RFID card. 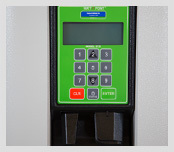 The 3703 communicates directly with a Payment or Gateway Module, and five status lights clearly indicate the progress of the charging operation. EV Charging Stations from EVSE LLC are the Smart Solution! EVSE LLC’s electric car charging units are smart-grid ready and now accept Automated Demand Response signals that control pricing and power during peak demand cycles. With a full line of EV charging stations, charger network management options including Open Charge Points Protocol (OCPP), usage reporting and payment options, and EV charger testers, our electric vehicle charging solutions easily adapt to your existing operations. 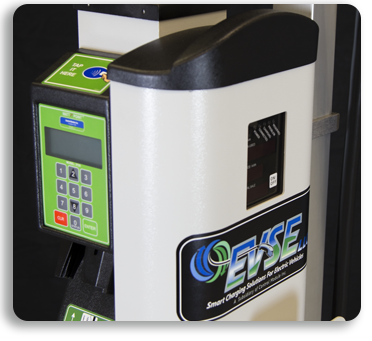 Designed to integrate with Amano McGann and other parking payment and access systems, EVSE LLC electric car charging units are a perfect fit for the modern parking industry. Our charger stations also integrate with the leading campus cashless card systems from CBORD and Blackboard. Why add an extra payment processing system or secure access system when you can use what’s already in place? Weight 14.8 lbs. (Excluding Pole); Pole Weight 9.8 lbs. ADA compliant per ADA 2010: Section 308 – height and reach, Section 309 – cable pull is less than 5lbs. Our solutions offer revenue and tracking resources with state-of-charge monitoring and multiple payment options. 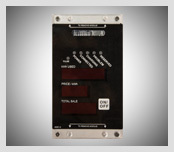 Designed for easy integration with existing operations and systems. Our EV chargers can be activated using a variety of methods including On/Off, RFID, proximity, 24/7 live operator, mobile phone app, and parking stub.